Congresswoman Matsiu invited CEO David F. Wiley to participate in a round table discussion focusing on small business issues plaguing entrepreneurs in the current economy. CEO Wiley participated as a panelist at the Intellectual Property and Licensing Agreements seminar held at Drexel University, Sacramento. This seminar was part of the SARTA Leadership Series of events, designed for to educate entrepreneurs and small business owners in the region. This invitation only forum for local professional is intended to create a forum among the many physicians and biomedical engineers in our community who invent medical devices. The SARTA MedStart initiative brings together the Sacramento region’s medical device community. Stratovan Corporation exhibited and provided interviews at the initiative launch held at Sierra Health Foundation. Stratovan has worked with Dr. Edward B. Strong from the UC Davis Medical Center Department of Otolaryngology to develop a revolutionary new method for measuring orbit volume from patient CT scans. Stratovan has joined the SARTA MedStart initiative as a way to foster medical device technology in the region. The UC Davis multi-disciplinary Symposium on Biomedical Image Segmentation is intended to foster communications and collaborations between the various UC Davis groups involved in this important field. 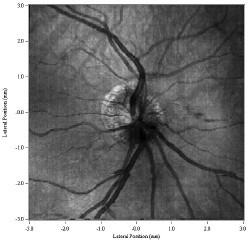 Stratovan participates as a commercial consultant to the BRP providing guidance for improving data visualization and analysis for adaptive optics optical coherence tomography (AO-OCT). Bring new life to your three-dimensional volumetric data by viewing it in its natural form. Gain contextual insight by viewing transparent blends of your complex data. Data that typically benefits from volumetric methods are magnetic resonance imaging (MRI), computed tomography (CT), PET, etc. Becoming more popular in the finite element field, higher-order elements capture a more complex data representation than their linear element predecessors and reduce the required number of elements needed to decompose fluid flow, stress, and other simulation types. Too big to fit into the main memory of a workstation, large data poses several problems that limits one’s ability to view, analyze, and work with it. Fundamental methods for processing geometrical surfaces are commonplace in today’s visualization and analysis packages. Tools that provide fast and accurate manipulation of large surface meshes are de facto in this class of tools. Image processing applications are a dime a dozen, what you need is a tool that solves your particular data processing problem easily and every time you use it. Customization of standard methods for your particular needs is something commonly available tools do not provide. Create blends of surfaces, such as car bodies or airplane fuselages, in order to give your design team new visual concepts or to explore the shape differences between two surfaces by using geometric morphometric analysis methods. A commonly occurring problem where two or more data sets must be aligned to one another for the purpose of comparison, blending, visualization, and analysis. Rotating, scaling, and translating the 2D or 3D data sets usually accomplish this so that the each correspond to one another based upon some specified error metric. When it comes to true accuracy in regards to the visualization of your data, you can only trust the robustness of ray tracing. These methods yield true quality images like those seen in Hollywood’s movies as well as extremely complex numerical simulations. When speed is more important than visual accuracy, real-time graphics provide supreme interactivity with the user. These methods are generally used for previewing large or complex data or can simply be the end product when speed is the only concern, such as for high-speed three-dimensional games. Choosing a visualization method that most easily and accurately conveys the meaning of data is not always a complex three-dimensional image. Sometimes, insightful meaning can most easily be conveyed by a simple graph and often interaction through these simple interfaces can greatly increase the understanding of complex data. Emphasis on more subtle features of data often provides more insight than expected. Finding this balance between realism and subtle cues is a fine art and greatly depends on the data and what insight the viewer needs.